Greetings again from the darkness. There is absolutely nothing that compares to being a parent. Sorry, pet lovers, it’s not even close. And I’m not referring to the romantic notion of having one’s DNA live on as legacy. Rather, nothing compares to the weight of never-a-break responsibility felt in keeping a helpless newborn alive and properly nourished. And later, teaching the right life lessons so that it’s not your kid who bullies others in school, or steals, or damages the property of others. Someone’s kid is going to do those things, and most of us try our darndest to prevent it from being our kid. The reality is, that even the most attentive and best-intentioned parents can sometimes fall victim to a force beyond their control. Such is the situation in writer-director Felix Van Groeningen’s film (co-written with Luke Davis) based on the two memoirs penned by father and son David and Nic Sheff. We open on David (Steve Carell) disclosing to a physician (Timothy Hutton) that his son Nic (Timothee Chalamet) is addicted to crystal meth, and asking two questions: 1. What is it doing to him? 2. What can I do to help him? The quiet desperation and pain is plainly evident on David’s face. We know immediately that this Steve Carell movie won’t be packed with laughs. What follows is the harsh reality of drug addiction. Rehab – Relapse – Repeat. Much of the story is dedicated to David’s struggle and devotion to helping his son Nic in any way possible. He’s a helpless father who refuses to give up on his son, despite the constant desperation and frustration. Every glimmer of hope is soon crushed by yet another lie and more drugs. The film is such a downer that it makes LEAVING LAS VEGAS look like an old Disney classic. Bouncing between timelines is a device that works for many stories, but here it seems to take away some of the poignancy and depth of some scenes. Just as we are being absorbed into a crucial moment, the film often breaks away to an earlier or later time. This is effective in getting the point across about the never-ending struggles, but we lose momentum on particular segments. Supporting work comes courtesy of 4 talented actresses: Amy Ryan (as Nic’s mother and David’s ex-wife), Maury Tierney (as David’s current wife), Kaitlyn Dever (Nic’s girlfriend), and LisaGay Hamilton (involved in rehab). It’s a bit odd to see the mini-reunion of Ms. Ryan and Mr. Carell from their time on “The Office”, but mostly the on screen time is pretty limited for all four women. 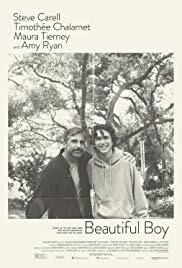 The reason this film works is the devastating work of two fine actors – Steve Carell and Timothee Chalamet. We never doubt dad’s commitment, just as we never doubt son’s helplessness in getting clean. The soundtrack acts as a boost to the dialogue with such songs (perhaps a bit too convenient and obvious) as John Lennon’s “Beautiful Boy”, Neil Young’s “Heart of Gold”, and Perry Como’s “Sunrise, Sunset”. It’s debatable whether it’s possible for a movie to look “too good”, but it’s a bit off-putting to admire the camera work while someone is struggling on screen with drug addiction. The downward spiral of drug addiction feeds on the misery, and while we all enjoy beautiful cinematography, this is the rare time that it’s distracting – possibly preventing viewers from going all in. The inherent lesson here is that we can’t always save people from themselves. Knowing what to do isn’t always possible, and sometimes there is simply no right answer … even with “Everything”. This entry was posted on Thursday, October 25th, 2018 at 9:55 pm and is filed under Drama. You can follow any responses to this entry through the RSS 2.0 feed. You can leave a response, or trackback from your own site.